The device allows scans of people in motion and requires a much smaller radiotracer dose. 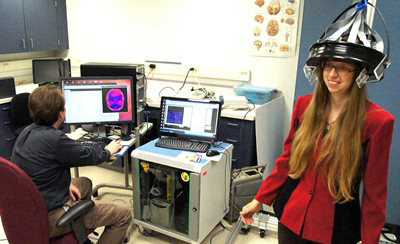 Scientists at West Virginia University in Morgantown have developed what they say is the first wearable positron emission tomography (PET) scanner to study the brains of people while they're in motion. The scanner, which makes the wearer look like a UFO landed on their head, eliminates the need for test subjects to remain perfectly still, according to a report in New Scientist. It also works using a fraction of the standard radiotracer dose injected into the bloodstream for a traditional PET scan. The researchers plan to use it to study the brains of people with neurological disorders such as Parkinson's disease, as well as the effects of treatments for stroke, the report says. Other test subjects will include autistic savants, who demonstrate extraordinary skill in a limited area, such as math. The scanner uses a dozen silicon photomultiplier technology (SiPMs) in detectors arrayed in a ring or helmet that can move with the head while the body is in motion, according to the researchers' study, published in the journal Brain and Behavior. They attached the scanner to the patient's head using an adjustable plastic frame and a chin strap from a standard safety helmet. The scanner weighs about 3 kg, and was supported by a bungee cord suspended from above, undetectable by the wearer but allowing for limited movement. The researchers imaged four male cancer patients as they spoke and moved about freely, angling the scanner to include the basal ganglia and visual cortex in the field of view. The prototype scanner produced images similar in quality to those of a traditional PET machine, according to the study. The team envisions using such a scanner for imaging patients with Alzheimer's disease, epilepsy, attention deficit disorder, and autism. Designers of future devices would need to consider the tradeoffs between a lower-weight device that allows greater mobility and a heavier one with greater sensitivity and a larger field of view, the study says. The wearable PET scanner is the latest in a series of innovations in medical imaging. Last year, a team of Massachusetts Institute of Technology researchers came up with a way to do medical imaging for much less money than what the current technology costs.